This Summer The Ravestijn Gallery presents Scheltens & Abbenes’ bright and colourful series ‘The Workers’. The Dutch artist duo, consisting of photographer Maurice Scheltens (1972) and visual artist Liesbeth Abbenes (1970), show their distinctive still lives: abstract yet compelling, and with a meticulous eye for detail. The works are a mix of studio photographs and images from the series ‘Trailer’, consisting of owers painted on vans from oral transportation docks, which premiered at Unseen in 2016. From afar the advertisements look like appealing owers, but up close the artificiality almost dissolutes the owers – within the context of the artists’ newest show the images are now instilled with a new layer of meaning. PR Info _This Summer The Ravestijn Gallery presents Scheltens & Abbenes’ bright and colourful series ‘The Workers’. The Dutch artist duo, consisting of photographer Maurice Scheltens (1972) and visual artist Liesbeth Abbenes (1970), show their distinctive still lives: abstract yet compelling, and with a meticulous eye for detail. The works are a mix of studio photographs and images from the series ‘Trailer’, consisting of owers painted on vans from oral transportation docks, which premiered at Unseen in 2016. From afar the advertisements look like appealing owers, but up close the artificiality almost dissolutes the owers – within the context of the artists’ newest show the images are now instilled with a new layer of meaning. 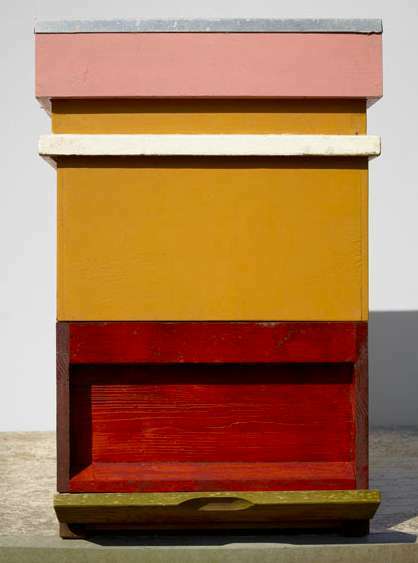 ‘The Workers’ consists not only of these almost still lives of painted owers – printed large scale as to make the texture and every trace of use on the vans discernible – but also shows very mundane objects: different tools for gardening, beehives in various colours, a garbage can with layers of chemical paint spilled over its edges. On the photographs, however, the objects are transformed into highly stylised and aesthetic compositions, drawing attention to the colours and shapes, up to the point the viewer would almost forget their original context, as the play of textures and layers is endlessly fascinating.